Tchaikovsky’s last symphony was written in 1893 and premiered with the composer on the podium. Nine days later Tchaikovsky died. The symphony was entitled Патетическая in Russian, translated into French as “Pathetique”, by which it is usually known in English. The title is ambiguous, the French term implies empathy or even pity, whereas the Russian word might better translate into English as ‘Passionate.’ The four movements have sometimes been interpreted as reflecting the passion of life that ultimately ends with a reflective finale. As one might expect from a Russian émigré, Serge Koussevitzky conducted a vast amount of Russian music during his long tenure (1924-49) at the Boston Symphony Orchestra. He was particularly keen to promote the work of contemporary Russian composers whom he knew personally, including Rachmaninov, Prokofiev, Stravinsky and Shostakovich. He almost certainly conducted more of their music other notable interpreters of Russian music active in the US at the time (such as Stokowski and Ormandy). In contrast to the twentieth century Russian modernists Tchaikovsky seems almost old fashioned, yet Koussevitzky retained a love of Tchaikovsky’s music throughout his career. This almost certainly stemmed from his teacher, Arthur Nikisch, who was the most celebrated interpreter of Tchaikovsky’s music in his day, but we should not forget that Koussevitzky had met and played with Tchaikovsky in 1892 at a time when Koussevitzky was best known as a gifted double bass player. 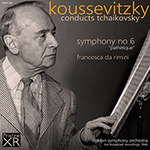 Koussevitzky made commercial recordings of Tchaikovsky’s 4th (1936 & 1949), 5th (1944) and 6th (1930) symphonies and there are several live recordings of these same three symphonies from NBC broadcasts of BSO concerts. There are three extant live broadcasts of the “Pathetique” symphony alone, from 1945, 1946 and 1947, the first two from Symphony Hall in Boston, the last from Syria Mosque in Pittsburgh. This issue of the 1946 broadcast, gives us the chance to hear Koussevitzky’s thrilling live interpretation of this symphony. The symphonic poem Francesca da Rimini was composed in 1876. It tells the tragic story, recounted by Dante in his Inferno, of the damnation of an Italian noblewoman. Francesca da Rimini and her lover were murdered by her husband and condemned to an eternity in hell for adultery. It is a somewhat gloomy work, offering no prospect of redemption. Koussevitzky made a studio recording of this piece just a few days after the live broadcast heard in this issue. These recordings sound far better than they have any right to. Performances such as these were broadcast live from Boston's Symphony Hall via ABC studios in New York. The method of transfer from Boston to New York was simple - a telephone line. From New York they were both broadcast and cut onto acetate discs, from which these recordings were sourced. One would expect a much diminished frequency range, and yet at times througout both pieces the upper limit is not the 5Khz or so often yielded by such means of transmission but closer to 17-18kHz - a range greater than that claimed at the time by Decca for its Full Frequency Range Recording system. It's not always perfect - there are some slight peak distortions at times - but it is remarkably good. I've also been able to fix some often terrible wow and flutter which had dogged the Symphony throughout.